This is the outside of our Living Locally leaflet. It is designed to be folded once horizontally, then concertina-wise, to give eight A5 panels. The cover panel illustration, by Imogen Clowes, is a view down Whiteladies Road from Blackboy Hill. The design and illustration of the remainder of this side is by Joey Gurdon. Both carried out the work during their final year as students at the University of the West of England, Bower Ashton. The maps, text and table on this side are by Sustainable Redland contributors. The individual sections are each expanded below to include links to the topics and organisations mentioned, as well as others that were not included in the printed leaflets. This leaflet suggests ways to help make our neighbourhood more sustainable. We would like to encourage more walking and cycling, especially to local facilities, and to encourage the use of locally grown food and of purchases from local businesses. We love our neighbourhood, and we all want to play our part in helping it to thrive. By being involved in our local community from day to day, supporting our local independent shops, reducing our use of cars, and minimising our use of fossil fuels, we can all help reduce the potential harm of climate change. Walking beats just about any other form of travel for improving health and well-being, and for minimising carbon emissions. It is also a great way to get to know the area and meet neighbours. Walking accounts for around 80% of journeys of less than a mile. But there are still many shorter journeys currently done by car that it would be better to walk. The map might help your choice of walking route by marking the steeper hills, in case you want to avoid them, but also pedestrian road crossings and public seats. For those who cycle, there are now more cycle stands near to shops (shown on the map), so doing local shopping by bike is not only easier but much friendlier to the environment than using a car. If you want help to get you started on a bike, the Bristol-based charity Life Cycle UK offers any adult who lives, works or studies in Bristol free cycle training. They also run the Bike Back scheme which refurbishes unwanted bikes and makes them available at affordable prices. Currently, 40% of our food is imported. With climate change and fossil fuel depletion likely to affect global agriculture, the sustainability of our food in the future is uncertain. Bristol is the first city to have a Food Policy Council, responsible for creating a Bristol Good Food plan. In addition, the Bristol Food Network is a collection of local groups working towards making ours a sustainable food city. In our area, the Whiteladies Road Farmers and Fair Trading Market has been offering local food and hand-made produce since 2006. It is held on the 1st and 3rd Saturdays of each month, 8.30am to 2pm, at the junction with Apsley Road. Several independent stores and restaurants serve seasonal, regional produce, such as from The Community Farm in the Chew Valley. This is a member-owned 28 acre organic farm which also delivers organic vegetable boxes locally. More people are interested in growing their own food. There are several allotment sites in our area, and a garden sharing scheme. The Metford Road Community Orchard is based on one of the local allotment sites. Shopping at local independent stores can help keep our local high streets active, diverse and full of character. Each pound spent with a local retailer selling local produce puts twice as much money back into the local economy compared to a pound spent in a national multiple. The Winning Whiteladies project champions local shopkeepers and has produced a map of all the shops in the area, available in local shops and cafes. Using the Bristol Pound when shopping is one way of making sure that the money we spend is kept for the benefit of the local region. A growing number of local shops and services accept it. Much of Redland Green was ancient farmland. Four of the ash trees on the Green are between 300 and 400 years old – one with two trunks being a former hedgerow tree. They provide an important habitat for a variety of wildlife and have been protected with the support of the local community. Many beautiful avenues of trees are a result of Victorian town planning, though the avenue along Lovers Walk is a century older still. Recently planted trees in Cotham Gardens, at Redland Road roundabout and other street locations show that we can still add to the diversity and richness of our natural environment. Many of us can use our gardens to help provide wildlife havens by planting suitable trees and flowers. There are a number of local community organisations and special interest groups and a variety of venues that can be hired for meetings in our area. If you would like to hold a street party, or to create a children’s play street for a few hours, the BS6 Open Streets project can help you gain the necessary permissions and loan you the required signage. The Redland and Cotham Amenities Society (RCAS) runs the popular Redland May Fair and has been helping protect and enhance our area’s architecture, open spaces and amenities since 1973. Members receive a newsletter three times a year, and can enjoy their annual Open Gardens. The Bishopston, Cotham and Redland Neighbourhood Partnership holds a Forum in Cotham and in Redland every three months where you can find out more about what is going on in our local community, and can have your say. For travel beyond our immediate area, buses and trains have a much smaller impact per traveller on our carbon footprint than going by car. Trains call at Redland then Clifton Down stations on their way from Temple Meads to Avonmouth or beyond to Severn Beach. On weekdays, there is one train in each direction approximately every 40 minutes. Several bus services have changed since the map was printed, and continue to do so at the whim of the bus companies. Please check on the Travelwest website for the latest information. Map data is used under the Open Database License ©OpenStreetMap contributors. 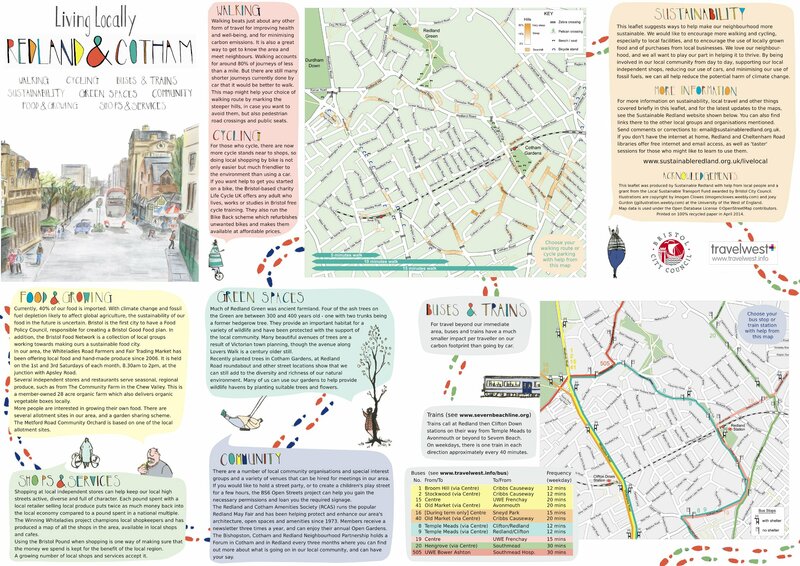 This leaflet was produced by Sustainable Redland with help from local people and a grant from the Local Sustainable Transport Fund awarded by Bristol City Council.